After rejecting a deal that included a $6,100 pay increase, teachers continue on strike for more funding for public education, better working conditions and higher wages. For the past two days, I’ve watched as over 30,000 teachers, students, and families arrived from all over Oklahoma to demand an increase of the education budget and higher wages for teachers and other staff. The sheer mass of people is breathtaking. I planned to livestream the rally, but it was impossible to so much as send a tweet due to the number of people in such a confined space. Most teachers arrived on chartered buses with dozens of their districts’ co-workers; most of the buses are free, with owners who volunteered their services in solidarity. 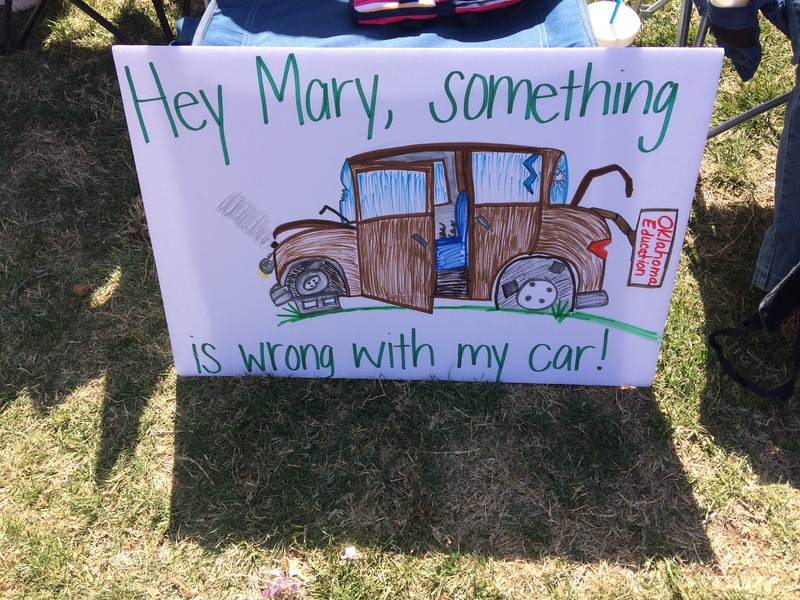 Both days, the 30,000 teachers packed the lawn of the State Congress, holding creative, funny and heartbreaking signs and setting up tents all around the lawn with food and drinks donated by local businesses and parents. The plethora of donations expresses the deep support that teachers have from the community. In the minds of legislators, it wasn’t supposed to go this way. On Thursday of last week, they passed a bill that provided a $6,100 raise to teachers but left the demand for an increase in the education budget almost entirely unaddressed. They hoped this would quell the insurgent teachers’ mobilization. They were wrong. Momentum is not on the side of the legislators. 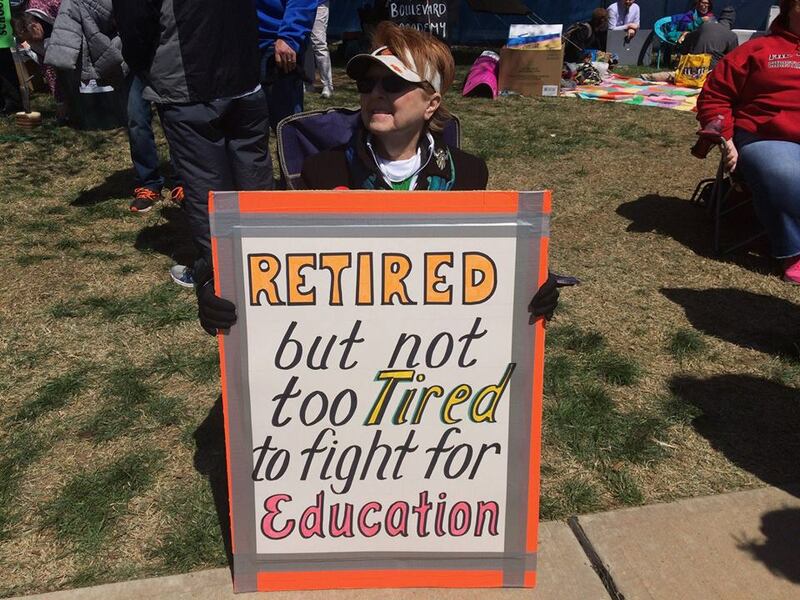 After the West Virginia teachers’ strike, there has been an explosion of teacher organizing around the country but especially in heavily Republican states, dubbing this movement the “Red State Revolt.” In Kentucky, thousands of teachers walked out Monday to protest an unexpected attack on their pension benefits. In Arizona, teachers are starting to organize ‘walk-ins’ in different schools as part of a struggle for a pay increase. West Virginia seems to have awakened an activism that refuses to accept promises or band-aid solutions; teachers want funding for schools, and they want it now. A few of the teachers who are mobilizing today participated in Oklahoma’s last teachers’ strike in 1990. One teacher, who was holding a sign that read “2018, 1990: I can’t believe I have to do this again!,” said that the previous strike seemed like a win for teachers — raising the education budget and teachers’ pay. “We learned we can’t trust the legislators. Everything they gave us they took away in the years after, and now look at us!” one teacher said. In the past 10 years, the education budget has been slashed by 28%. As Drama teacher Shelly Barryman explained, this means that today she makes $4,000 dollars less than she did 10 years ago. Oklahoma teachers, students, and families are furious at the conditions in their schools. Teachers work more than one job just to make ends meet. One sign at the protest read: “My second job paid for this sign.” Many teachers leave their teaching posts in the middle of the year, seeking better jobs elsewhere. 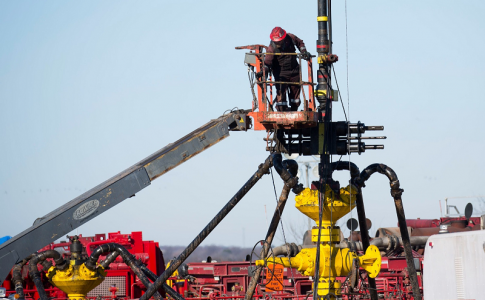 Some leave teaching altogether, taking up jobs in the many oil companies in Oklahoma. Others go to Texas, which spurred another popular sign: “All of my exes are in Texas.” There is a huge teacher shortage in Oklahoma, with some classrooms being filled with substitutes with little teaching experience for months at a time. On Monday, at the opening rally, a student explained that her geometry class had 38 students in it and the teacher resigned mid-semester, leaving students with “a revolving door of substitute teachers who were not certified to teach a rigorous curriculum…” Now she takes her math classes online. The schools are falling apart; black mold, flooding, and walls that are falling in. Textbooks are a big problem: They are old, outdated, and there aren’t enough of them. Joshua Branch told me that at his high school, there were no books; the students were supposed to take pictures of the book to do their homework. At the opening rally, a student showed us her history textbook — a book which was held together by tape and in which George W. Bush was president. As she spoke, teachers around me yelled out “Teachers bought that tape!” This is undoubtedly true, given that schools desperately lack supplies, including everything from paper to tape to paper clips. Rural districts have it worse, and some have even cut the school week to four days. While this isn’t an official strike, teachers are “calling in sick,” and superintendents are canceling school in most districts. For example, in Guthrie only 36 out of the 219 teachers need to call out sick for the superintendent to cancel classes. The teachers have easily achieved that number every day with about double that number taking the half-an-hour shuttle ride to the state capital every day. 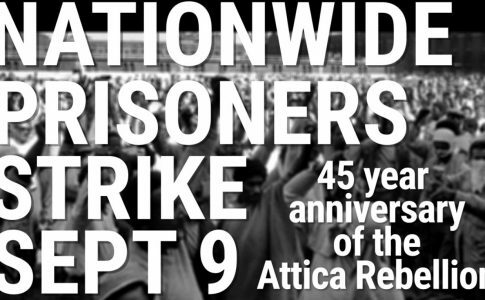 Unlike a traditional strike, this walkout is not organized by any centralized body. There are three teachers’ unions, and the majority of teachers are not unionized. According to Alona Whitebird, this has put teachers in a weak position in negotiations and is one of the reasons that conditions have gotten so bad. However, unions have not always been enthusiastic about mobilizing teachers either. 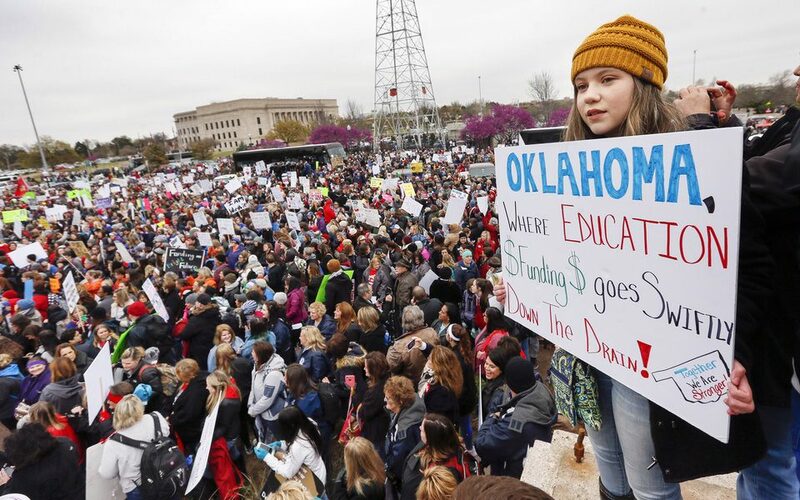 Both the Oklahoma Education Association and the American Federation of Teachers, the two largest unions in Oklahoma, had to be forced to endorse the walkout under the threat of a dues strike. So how did over 30,000 teachers end up in Oklahoma City two days in a row? 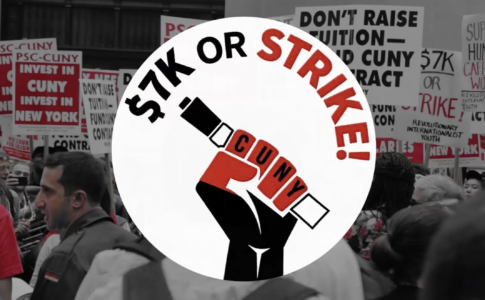 How is this hybrid of a strike being organized? Facebook and pent-up anger, says middle-school math teacher Mary Robinson. 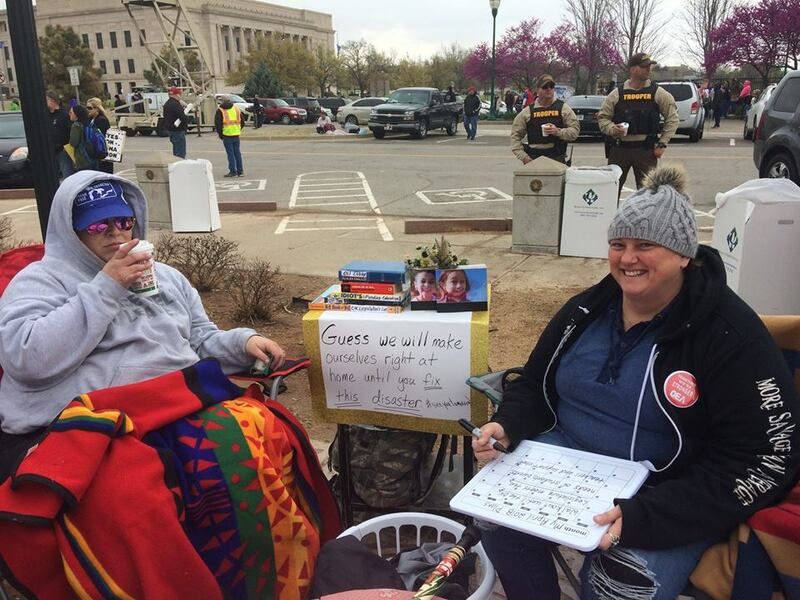 After the West Virginia teachers’ strike, Oklahoma teachers realized they could do the same thing, so overnight they set up a Facebook group, and very quickly dozens of thousands of teachers joined. It was on. This makes the organizing very grassroots and ad hoc. Each district is organizing differently, and there aren’t any bodies for democratic debate and decision making. Rather, in many districts, leaders emerge organically. When sitting with Bryan Dearing, who is helping to organize his district, several teachers came to check in before leaving the rally. What’s the plan for tomorrow? What’s the plan for the next days? The answer? Come back every day until we get the funding we need. Other teachers said they are getting their information online and via text message. So far, the focus of the organizing has been on convincing legislators. On Tuesday, when I arrived at the state Legislature at 9 am, there was a line that wrapped around the block, waiting for teachers to enter to speak with their representatives. By 10:15 am, it was announced that the building was packed and was in fact, at overcapacity. New teachers would only be able to enter one by one as others left. After a backlash, he was forced to issue a bizarre “apology” in which he blames “outsiders” for “some of the things that have been happening.” He even claims death threats to the Capitol, an entirely absurd idea given that no one else seems to be concerned about this possibility — not the families with small children outside, not the teachers and not even the security guards roaming around the grounds. Governor Mary Fallin has also perpetuated the myth of outside agitators, claiming that Antifa is at the marches. Teacher Kathy Ice says, “You can tell we are teachers. We got 30,000 or more people here and there hasn’t been a single fight. 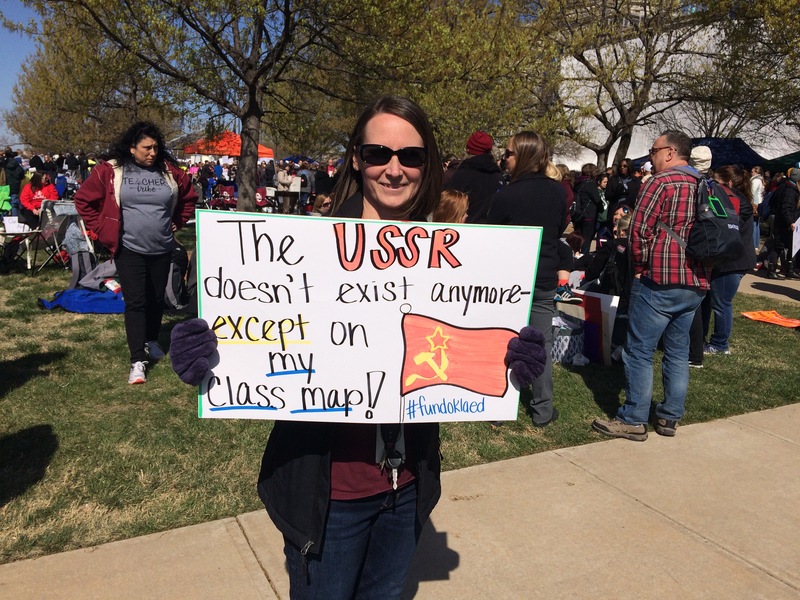 A single disturbance.” In fact, these teachers have demonstrated nothing but solidarity and kindness to one another, offering coffee, seats, thumbs up signs and cheers throughout the day. On the first day, a mother lost her 8-year-old son, Ben. The rally was stopped and she got on the microphone to plea for her son to come to the stage, with despair and fear in her voice. How could she find a 8-year-old boy in that sea of dozens of thousands of people? Everyone in the crowd sat down on the floor, in silence, to make it easier to find Ben, who after a few painstaking minutes, was found and brought to his mother. That represents the kind of people in this crowd. 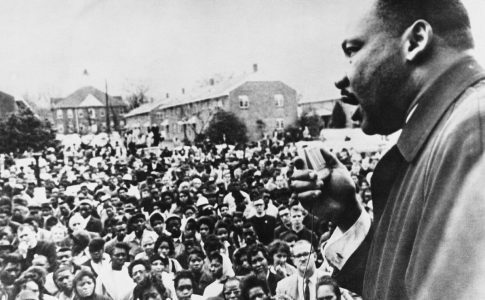 Attempts to demonize the teachers, to invent “outside agitators” is a bold-faced lie. These are teachers who, as dozens of signs say “would rather be teaching,” but are fighting for their students instead. While there is deep indignation with elected officials, the solution provided is to “vote them out,” the same solution offered by the recent protests against gun violence. In fact, on Wednesday, a youth protest in planned in which protesters will wear white t-shirts with the day they turn 18 on their shirt as a warning to legislators. The strategy so far has been to rally at the state Legislature. However, in order to win, the people that teachers need support from are not in the Legislature, they are in the communities surrounding the schools. Only by winning over the unbreakable support of families and the community will teachers be able to impose their will on a Legislature that has cut 28% from the education budget over the last 10 years.